CCL carried out the original post-tensioning of the bridge in 2001. 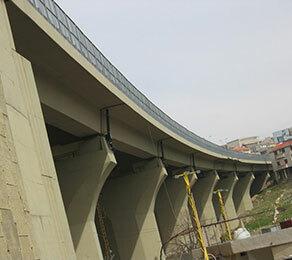 Three different types of post-tensioning were undertaken: precast pre-tensioned U-girders, which were prestressed during pre-casting before installation of girders; post-tensioned bars at the supports of the box girders, and over the piers during girder installation; and external unbonded post-tensioning at the hollow parts of the box girders, located at the supports. During the 2006 war, the bridge was bombarded and span five was particularly badly damaged. In 2009, CCL was engaged to carry out repairs to the bridge. CCL repaired the damaged section by replacing the external unbonded post-tensioning and substituting the internal broken pre-tensioned strands with equivalent external bonded post-tensioning.